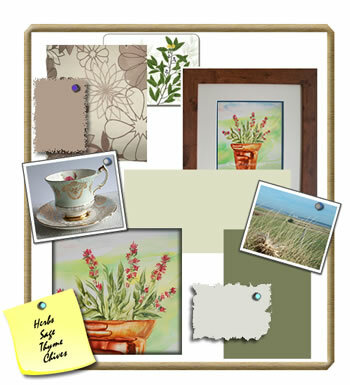 Mood boards are used in many ways and for all sorts of presentations and concept design purposes, from advertising and marketing proposals to home interior decorating to fashion concepts, in fact many sectors use mood boards in one way or another for large scale projects to use in our own home décor. Using a mood board is a way to illustrate a plan, idea or concept and bring to life such ideas, mood boards can be physical with fabric swatches or digital giving a more visual overall concept. They can also be as complicated and detailed or simple as we like depending on the project they are being used for. We recently decorated our kitchen / dinning room, the dinning room is part of the kitchen but also set to the end so is not surround by the kitchen itself, with this project we had some design restraints as the cupboards could not be changed and therefore the sage green of the units needed to feature in our plans. This digital is a mood board, is a very simple one showing how we changed the colour of the walls to a green : Dulux English Mist 5 added some soft furnishings to compliment my favourite arm chair that resides in the dinning room and I created three original art paintings to adorn the walls, these paintings are of herbs in pots, which tie in with the table setting and some of my vintage china, thus bringing the revamp together. archives of the Guest Post category.